To view your classes, click on the Class Lists icon from your dashboard. Then choose a class that you would like to see more information about. The class page will then be displayed, allowing you to create new items relating to the class or to view further information in the tabs along the top. The way that classes are displayed will look slightly different if your school sources class information from an integration. This tab shows any homework tasks that have been assigned to the class, along with the approximate time remaining until all students have completed the task, and how many students have done and not done the task. 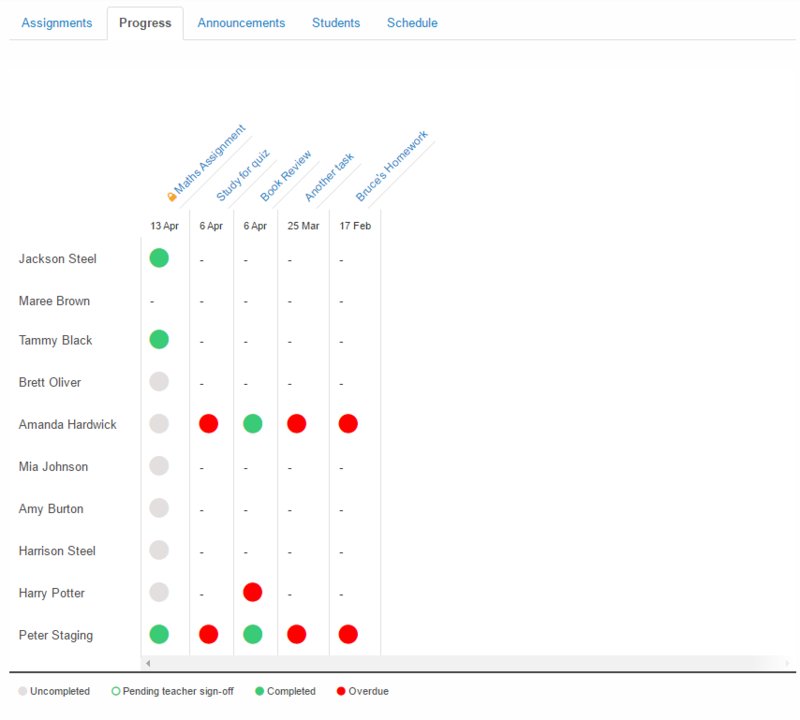 The homework and student progress can be viewed in further detail by clicking on the task, and changes or bulk updates can be made to the task by clicking the options menu on right. This tab provides a graphical representation of how students have been progressing with the tasks that have been assigned to them. This shows any announcements that are scheduled or have previously been sent to the class. This shows the students enrolled in the class as well as information about their completed and outstanding work. Specific information for all tasks assigned a student can be found on the Homework tab of the student details page. This shows each occurrence of the class in the timetable.